Volutin Granule Staining Technique and its Details. 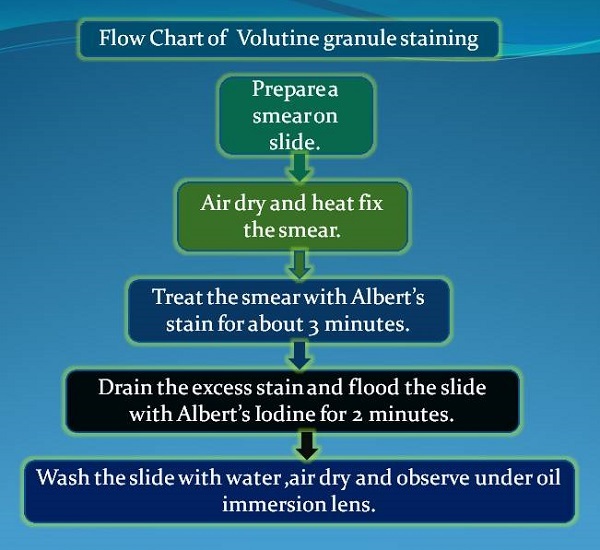 Flow chart of volutine granule staining procedure. Albert stain is basically made up of two stains that is Toluidine blue’ O’ and Malachite green. The pH of Albert stain is adjusted to 2.8 by using acetic acid. As we know cytoplasm of cell has neutral pH so the pH of Albert stain is acidic for cytoplasm. Where as pH of Albert stain is basic for Volutin granules as pH of Volutin Granule is highly acidic. Therefore when we apply Albert’s stain to the smear the stain Toluidine blue’ O’ stains the most acidic part of cell that is Volutin Granules and Malachite green stains the cytoplasm. As we know due to Metachromatic property when granules are stain with blue stain they appear red in colour. So here when we apply Albert’s iodine due to effect of iodine the metachromatic property is not observed and granules appear blue in colour. The volutine granules appear bluish black in colour as well as cytoplasm appear light green in colour.